The CMS and ATLAS experiments at the Large Hadron Collider joined forces to make the most precise measurement of the mass of the Higgs boson yet. On the dawn of the Large Hadron Collider restart, the CMS and ATLAS collaborations are still gleaning valuable information from the accelerator’s first run. 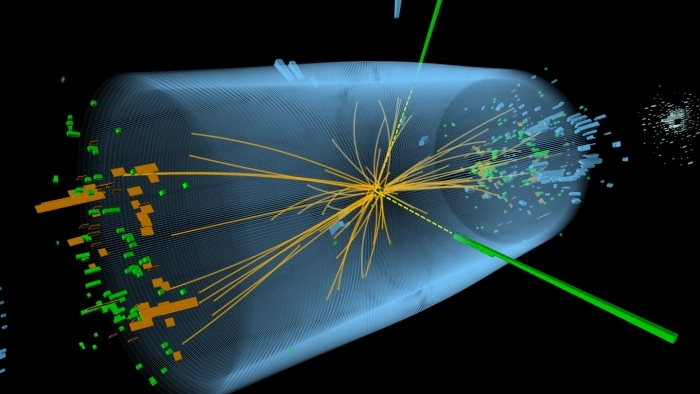 Today, they presented the most precise measurement to date of the Higgs boson’s mass. The mass is the only property of the Higgs boson not predicted by the Standard Model of particle physics—the theoretical framework that describes the interactions of all known particles and forces in the universe. Standard Model of Particle Physics. The diagram shows the elementary particles of the Standard Model (the Higgs boson, the three generations of quarks and leptons, and the gauge bosons), including their names, masses, spins, charges, chiralities, and interactions with the strong, weak and electromagnetic forces. It also depicts the crucial role of the Higgs boson in electroweak symmetry breaking, and shows how the properties of the various particles differ in the (high-energy) symmetric phase (top) and the (low-energy) broken-symmetry phase (bottom). The mass of subatomic particles is measured in GeV, or giga-electronvolts. (A proton weighs about 1 GeV.) The CMS and ATLAS experiments measured the mass of the Higgs to be 125.09 GeV ± 0.24. This new result narrows in on the Higgs mass with more than 20 percent better precision than any previous measurements. Experiments at the LHC measure the Higgs by studying the particles into which it decays. This measurement used decays into two photons or four electrons or muons. The scientists used data collected from about 4000 trillion proton-proton collisions. By precisely pinning down the Higgs mass, scientists can accurately calculate its other properties—such as how often it decays into different types of particles. By comparing these calculations with experimental measurements, physicists can learn more about the Higgs boson and look for deviations from the theory—which could provide a window to new physics. “This is the first combined publication that will be submitted by the ATLAS and CMS collaborations, and there will be more in the future,” says deputy head of the ATLAS experiment Beate Heinemann, a physicist from the University of California, Berkeley, and Lawrence Berkeley National Laboratory. ATLAS and CMS are the two biggest Large Hadron Collider experiments and designed to measure the properties of particles like the Higgs boson and perform general searches for new physics. Their similar function allows them to cross check and verify experimental results, but it also inspires a friendly competition between the two collaborations. Normally, the two experiments maintain independence from one another to guarantee their results are not biased or influenced by the other. But with these types of precision measurements, working together and performing combined analyses has the benefit of strengthening both experiments’ results. It also provided the unique opportunity for the physicists to branch out from their normal working group and learn what life is like on the other experiment. With this groundwork for cross-experimental collaboration laid and with the LHC restart on the horizon, physicists from both collaborations look forward to working together to increase their experimental sensitivity. This will enable them not only to make more precise measurements in the future, but also to look beyond the Standard Model into the unknown.